Texans understand that skateboarding isn’t just a hobby—it’s a way of life. And like with any way of life, it’s important to find other like-minded individuals who share your passion. At the following 10 best skate shops in Texas, you’ll not only find the best gear around but like-minded skaters to help you out. Select Skate Shop in Houston, Texas stocks brand name and indie skate equipment. Brands include Altamont, Carhartt, Ironlak, Adidas, New Balance, Hopps, and more. Check out their website for videos, free radio, and more information. Rec Shop in Dallas, Texas is big, bold, and awesome. They specialize in music, paint, and skating. They carry longboards, old school boards, skate boarding equipment, and more. They are happy to support the local skate scene any way they can. Apparition Skateboards is a relatively small skate shop in Austin, Texas. Come in to their physical storefront or order online and enjoy free shipping on orders over $100. Products include decks, wheels, bearings, helmets, shirts, pants, hardware, and more. Alta Vista Skateshop in San Antonio stocks boards, shoes, t-shirts, and artwork. While they’ve got a great selection of products, Alta Vista is known mostly for their excellent customer service. They’re happy to help anyone, regardless of experience level. Crooks Skate Shop in El Paso offers free shipping on all online orders over $75. Their inventory includes boards, shoes, trucks, wheels, bearings, and more. Brands include Alien Workshop, Almost, DGK, Element, Enjoi, Streetplanet, Welcome, and more. Check out their website for a full listing of brands. Gnarly’s Skate Shop is “a skate owned and operated core skate shop that is here to provide you with quality goods and services.” Part of their mission is to carry on the skating tradition with the next generation. To those ends, they provide seasonal skate camps in addition to their inventory. Created Skate Shop is a family-friendly skateboard and longboard spot in New Braunfels. They have an online and physical storefront location and regularly offer astounding deals. The online shop includes just about everything you might need. The General Store Skate Shop in Keller, Texas, stocks a wide variety of boards and attire, including branded and skate boards featuring art from pop culture, like Dragon Ball Z. They’re known for their excellent customer service, wide selection, and reasonable prices. Check out their apparel and footwear next time you’re in, too. 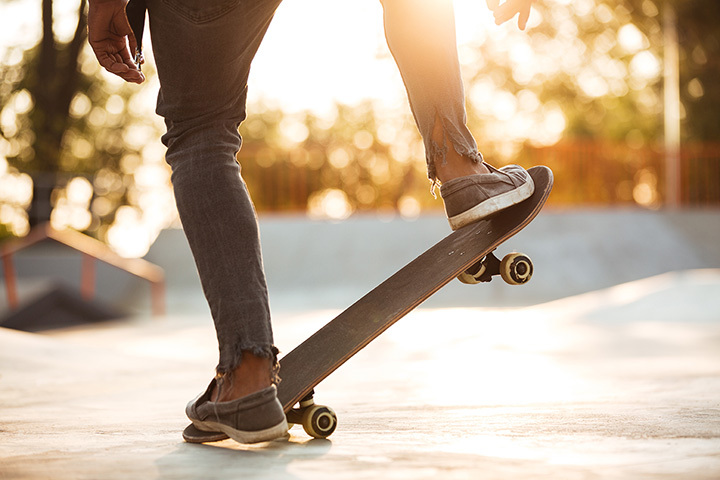 Rhythm Skate Shop is your one-stop-shop for all things skate boarding in Grand Prairie, Texas. They stock brands including New Balance, Vans, Boned, and Creature. Come in to stock up on boards and boarding equipment, footwear, clothing, and accessories. Texas Skate Boards and Apparel is open every day of the week starting at noon. They stock boards, helmets, custom t-shirts, and more. Their website doesn’t do their full inventory justice, so your best bet is to make your way into the shop to check it out for yourself.